1.5 So what are you waiting for? Achieve the kind of chrome texture that you need for your design and choose from one of these amazing effects! When you think about graphic design, you always think about how hard it is to make. Why? Because there are various things to consider but ultimately, it all boils down to whether your audience like your design. This is when texture comes in. Different types of textures such as marble texture, chrome texture, natural texture, etc., can greatly help enhance your design. How does texture help you in your graphic design? Graphic designers are still convinced that texture can serve as an important element for flat design, allowing each component to amplify the others quality. This is why, even if its place in the design world is smaller now, it is still very much important. You cannot identify the purpose of something if you do not know anything about it. So what is texture in the world of graphic design where majority is in a two-dimensional medium? Actual texture refers to graphic design products that incorporate an actual 3d texture effect. Some examples of this are book covers, product labels, business cards and other paper products such as paper bags, stylish boxes. Most designers commonly take advantage of fabric-based textures for hard book covers. Furthermore, they also use raised letters or text for soft book covers. Texture comes from the Latin word textura, which means “weaving”. This is where most graphic designers got the idea of using fabric in book covers and other designer products. A number of texture techniques are also used in making business cards. Business cards are very important for professionals who are running the business world. To make business cards more appealing, graphic designers often apply texture that captures the eye. Most of this would include raised fonts, chrome texture for background, thickness and grain. Labels are another example for a textured approach. The labels that you put on your product can greatly affect how it is received by consumers. These are often present in beers and wine labels which should be nicely textured in order to achieve elegance that is pleasing not only visually, but through the touch as well. Chrome texture can also achieve great impression on bottles, vases and other breakables. Texture can also be applied on how you display photographs. There are many galleries that display photographs from photographers that often use texture to enhance the beauty of their image. This is also used in web sites, posters, magazine layouts, and billboards. Texture evoke a sense of imagination from the audience that will contribute to how the message of the designs. Chrome texture can be used in either both print or web design. Web landing pages generally will not look boring if you apply texture along with the elements of creating a website such as suitable fonts, and layout. Simulated texture is achieved when graphic designers use sophisticated tools, especially digital ones in order to reproduce the look and the feel of an actual texture without basing them on a photograph. Graphic designers use different techniques for this. Overlay. Overlay is achieved when the designer wants to display the look of several successive layers either receding back into space, or are on top of each other. This will create a three-dimensional output. Simulations. Are designs that are not based on real photos but consists of patterns, shapes, and elements all weaved together to form rich textured results. Chrome texture can be used in order to balance the background and the foreground as well as provide a trick to the eye. You can make any text and have that has an 80s chrome texture and brush effect. This is easy to make as you only need to double click on the “Your Text Here” layer that is provided in the hi-res PSD to add your own text and the font of your choice, click “Save” and you sit and watch the effect as it take place. All layer styles and extrusions will take effect after clicking “Save”. This includes hi-res (14” x 14” at 300 DPI), layered PSD with smart objects for the text. It is available for $10. This is available for just $9! You can create a realistic chrome texture in Photoshop that is extremely difficult for most graphic designers. 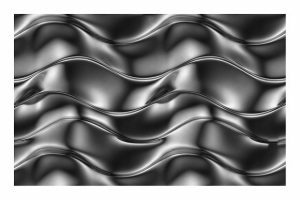 The reflecting surface of these textures will provide your designs an edge over others. 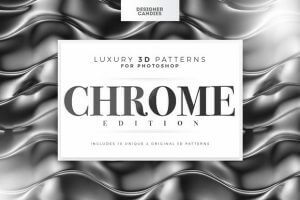 The 3D Chrome Pattern Packs for Photoshop will add photorealistic chrome texture effects to your projects, and layer styles. Each pattern is with a realistic chrome texture effect! Provides high resolution renders that is ideal for both web and print! 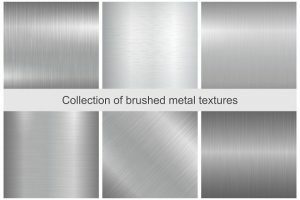 This is a collection of brushed metal chrome textures that are suitable for invitation cards, gift cards, as well as paper bags. The set includes six quality backgrounds for your designs and ideas that have good visual and metallic feel. The set contains three AI, three APS (10), and 3 JPG (300 DPI). It is available for $6. This is another product design that you can use for your chrome texture needs. 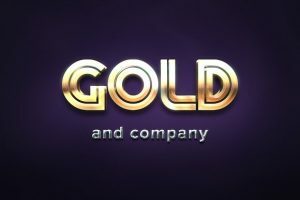 Gold captures the eyes of consumers as it exudes elegance and power. You can use this unique layer style effects for Photoshop and watch as it breathes a whole new life to your designs. All of these files are editable and does not require extra textures or plugins. You can get all these for only $8. So what are you waiting for? 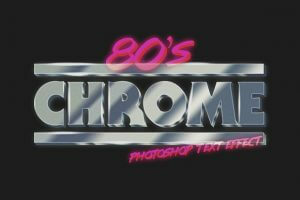 Achieve the kind of chrome texture that you need for your design and choose from one of these amazing effects!